Happy December - my Most Favorite month and bittersweetly the last one of each year! December is the month I go crazy with decorating the house, usually I start the day after Thanksgiving or sometime later but try to have the tree up by St Nick's (Dec 6th). Happy St Nick's too, by the way! Oh and the photo below of my December Currently post is that of the mantle in my cozy, pretty decorated, bright and colorful home. This year though I did put my main tree up on Thanksgiving day. Mainly because we purchased it that same day (on huge sale) at Meijer's and I wanted to see how it looked out of the box (the tree on the picture below). Once we started opening up the branches and it was all up and ready to go, I just went to the basement and grabbed some of the Christmas Ornament boxes and that was it lol. And since we were speaking of Christmas trees, you are supposed to keep them up/decorated until January 6th. doing: all the decorating possible. I have also been doing several acts of kindness since when November started, continuing through Dec 31st. I have been very generous and I have given away toys, clothes, books, you name it. I am participating in the "Mittens for Detroit" charity this year too and last but not least I have been very kind and generous when it comes to dining out too. Just today I tipped our server 40% of the original bill and last week, another server got a 30% tip. Working all those years in restaurants have also made me appreciate servers, especially around the holiday season. They work long hard hours and get paid next to nothing. enjoying: this month and the last few days of the year as much as possible. Decembers are so hectic and constantly busy for everyone but I try to still enjoy them. I try to beat the crowds when I can, I am polite everywhere I go, even to some undeserving people. I enjoy the moment, be it a very quick cup of coffee from McDonald's drive-thru or a long day with my girl, which at some point will be filled with toddler tantrums. 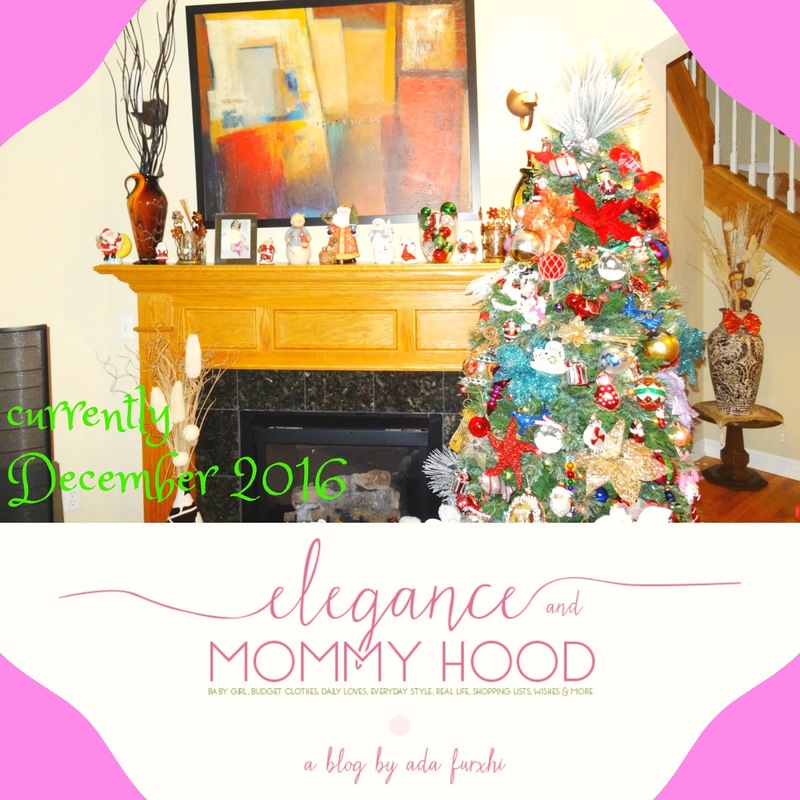 Sometimes I take time at home and relax by enjoying a movie on TV (Hallmark's Christmas movies have my heart at this time of the year) and look around the very dressed up, bright, lit, happy-decorated home. cooking: I haven't been doing much cooking lately, unfortunately, due to being so busy. I still cook most of my daughter's meals but I have been relying (myself) more on sandwiches, quick salads/soups, sometimes frozen foods (I do buy the organic kind though), pizza, carryout or my mom's cooking mostly. And I can always be found snacking on almonds (preferably the salted kind), Lindor truffles, coffee which I love topping with marshmallows and whipped cream this time of the year, butter cookies (they come out at this time of the year each year and are only sold at Costco - they are the best!!) apples, or a mandarin orange or two. wrapping: nothing yet. I have plenty of pretty wrapping Christmas paper and some different Disney paper I purchased on sale last year after the holidays though. I am also behind with Christmas shopping - no lie. I got half of Viv's things but not so much for the others. On a style note I have been wrapping myself with scarves, wraps and sometimes even huge blanket scarves, since it has been very cold the last couple of weeks. playing: Christmas music, duhh! I started late this year but finally the day before St Nick's I turned into our trusted Christmas Music Radio Channel we have here in Detroit and yeah I will be playing Christmas music most of this month. I have also been playing all the latest songs of a music festival they do this time of the year in Albania. The live finale night is this coming Saturday and I cannot wait to see who wins. There are so many great songs this year! 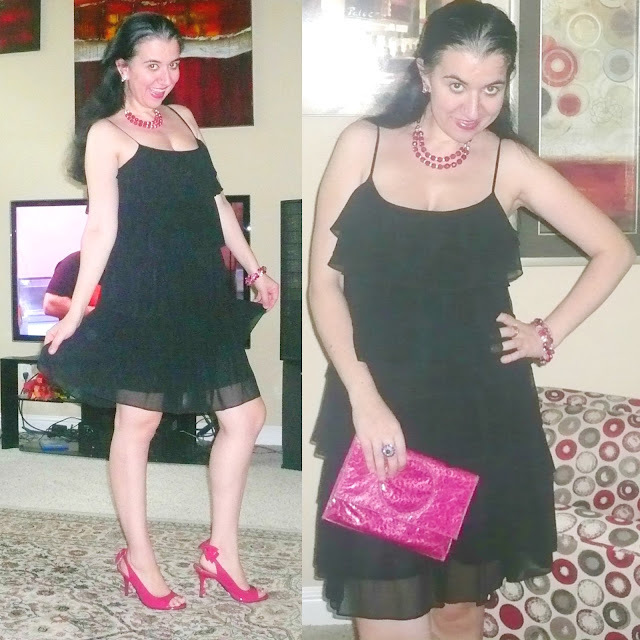 Here is a little throwback to what I was wearing on this date or a close date on the blog, in the past few years I have been blogging. I always think this is a fun way to look into my past self and the way I dressed, for the same season, in the past. I am focusing in dresses this December so I picked three outfits featuring dresses. I would still wear all of these dresses and am satisfied with all these three looks. I would wear them all in 2016. I have had this dress (and still own it) in my closet for a good decade. It is timeless since it is a Black+White Shirtdress (love the knee-length) in a small houndstooth print. 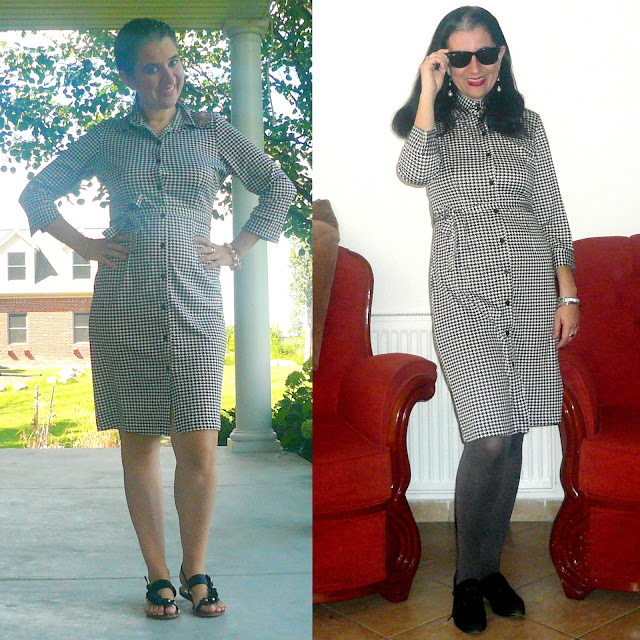 In this post I showed how to take this dress from late Summer into Winter. For the Winter part I wore it for my mother in law's birthday dinner. I stayed monochromatic both seasons by pairing it with black shoes. This timeless dress can be worn for the holidays too. I picture it with semi-opaque black tights, red satin, suede or patent leather pumps or red booties if you own them, a red oversized clutch, your hair pulled in a french bun, a crystal necklace and some crystal bold earrings. Finish it off with red lipstick, of course! This post and this outfit was actually blogged a few days before Christmas but in reality it was shot at least 10 days before that. And yes it was warm for bare legs and a light blouse (I would wear a coat on top though). 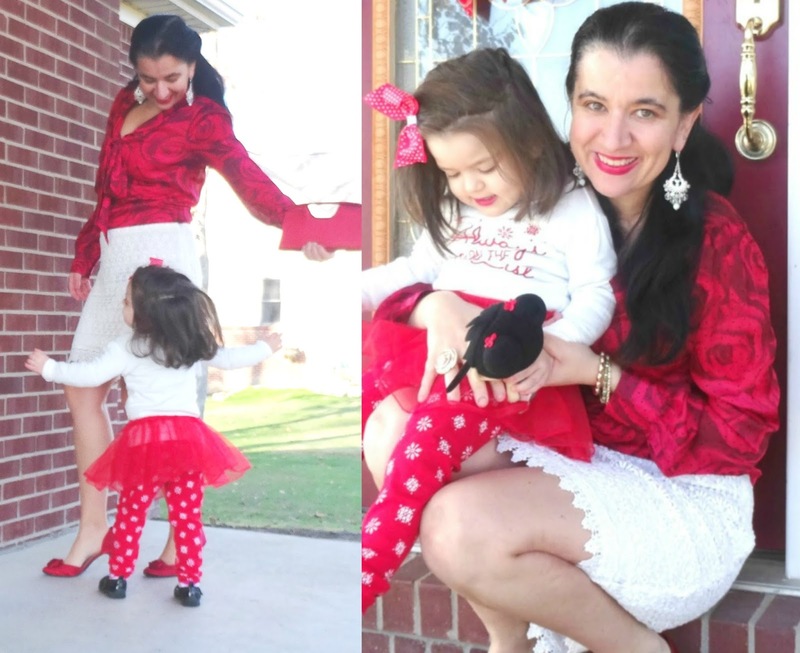 I must say this was my most favorite post of all 2015, one of my most favorite outfits in 2015 hands down and it also featured my favorite Vivian+Mommy picture of 2015 - the one on the left of Vivian hugging me as I look into her. This is not a dress but if you pair the off-white lace skirt with a white lace or off-white lace blouse tucked in and add a wide wrap/obi belt on the waist so that you couldn't see the two separates you can fake a white dress. And if you have been my follower even for just 2016, you know I love a LWD. This is such a beautiful Christmas/Holiday look. Red and white paired up is perfect for this time of the year, coordinate with your kids and partner, if you like. It would make for great Christmas cards' outfits. What are you all doing and how are you planning to celebrate this December? Are you all decorated, have you done most of your gift shopping, etc?! Let me know. =) As always, I am linking up with ANNE from In Residence.